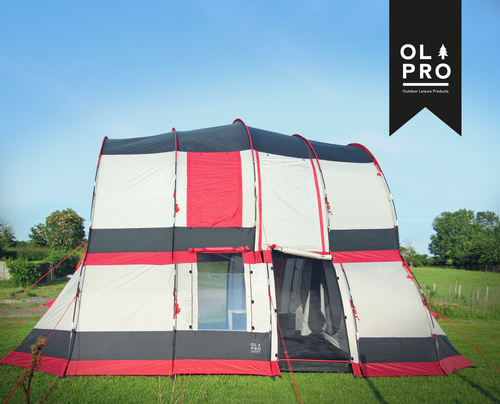 British tent manufacturer, www.olpro.co.uk has developed the world’s first-ever, family tent that boasts an upstairs as well as a downstairs. The Downton 8 is a spacious, eight-berth tunnel tent featuring poles made from a aluminium/ lithium alloy - the same material used to build the US space shuttle’s lightweight fuel tanks. These provide all the support needed for the carbine and latex floor, which is strong enough to hold four adults yet flexible enough to roll away for storing. The tent is a giant pop-up construction which takes seconds to erect and a matter of minutes to put away again. At OLPRO we make the difference between a good camping trip and a great camping trip -with superior tents and a wide range of top quality camping and caravan accessories. We believe that camping shouldn’t be about compromise, which is why we developed our own line of family tents, sleeping bags, lighting and windbreaks - we even offer our own line of tent pegs too! Everything we do is designed to improve your camping experience, and with forty years of camping expertise we aim to eliminate the frustration and hassle that can often arise from subpar camping products.